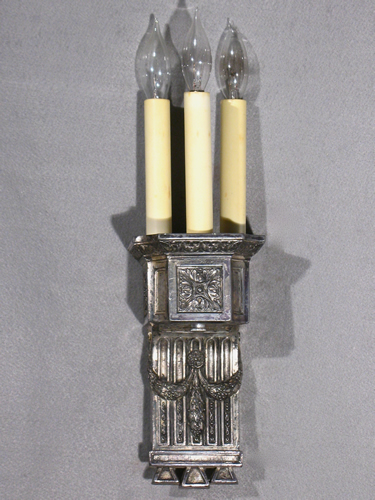 Very stylish Egyptian Revival candle sconces with a wonderful old silver plate finish, have a lot of the classical details that could be seen near the Pyramids.A symbol of three pyramids are on the very bottom of these Sconces. Wreath and swag garlands, paneled medallions and fluted columns make these sconces not too ornate, but with nice detail. Three candelabra sockets will provide plenty of illumination.